In a world where the population is only getting bigger and recourses are starting to deplete, the “old fashioned” way of growing food is just not good enough. Today’s world population is getting closer to 7.5 billion (more specifically 7.21 billion at the moment). Population of such huge dimensions is definitely going to need a lot of food, water, a place to live, etc. According to some accountings, 200 kg food per year is needed to one human being. That means 1 trillion and 500 billion kg food per year (7.5 billion x 200 kg). Even though, recently there are some efforts of automation of food production, still its almost impossible to expect that the current food production will produce a quantity of food of those dimensions. On the other hand, there are truly some breakthroughs in the field of creating artificial fields on which are going to be possible to grow different types of plants. 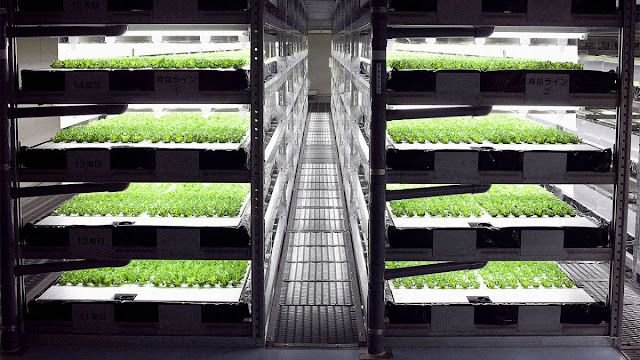 Japanese company named Spread in 2017 will open its first fully automated lettuce farm. The farm is planning to be a 4.800 square meter (52,000 square foot) fully-automated indoor complex that’ll cost up to 2 billion yen to build ($16.5 million USD). According to Spread, there are six stages to growing a lettuce at a factory: seeding, germination, raising the seedlings, transplanting them into a larger bed, raising the vegetable and harvesting. The most impressive fact is that the whole process plus, temperature control, humidity, level of carbon dioxide, sterilization of water and lighting hours is going to be fully automated. People are probably going to be needed only to confirm the germination. Beyond that, every process is automated, it says. Stacker cranes are going to carry the lettuce seedlings and hand them over to robots which will take care of transplanting them. 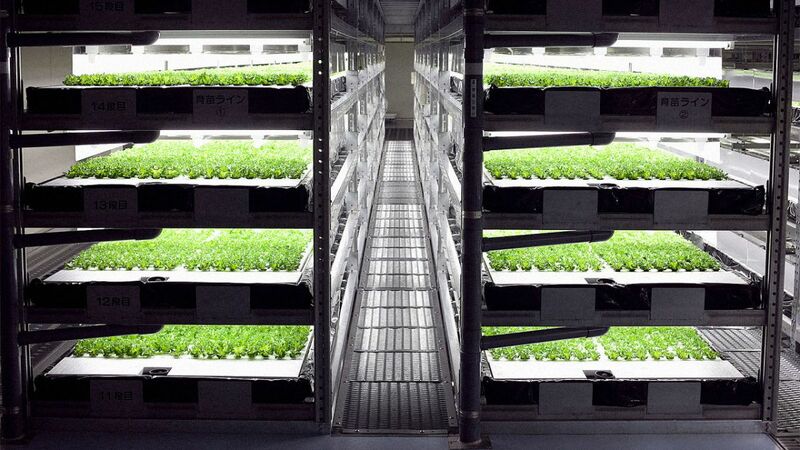 Once, fully grown they will be harvested and delivered automatically to the factory’s packaging line. Spread is going to go even further. Apparently automation is not the only news from Spread. The farm will also recycle the 98% of the water used in the processes. And, because the farm is indoor there will be no need of harmful pesticides or, insecticides (Is it possible this farm to healthily the food production?). The Kyoto-based firm Spread already produces 21.000 heads of lettuce every day, but after building the new automated firm, they expect to increase their production to 30.000 heads a day. And, because apparently robots are going to be the next farmers, the new factory is going to cut labor cost by 50 %, meaning the cost for the consumers are going to be reduced as well. So, it may be a problematic concept if you look from the cutting labor side, but in terms of ecology, and efficiency it’s absolutely positive.